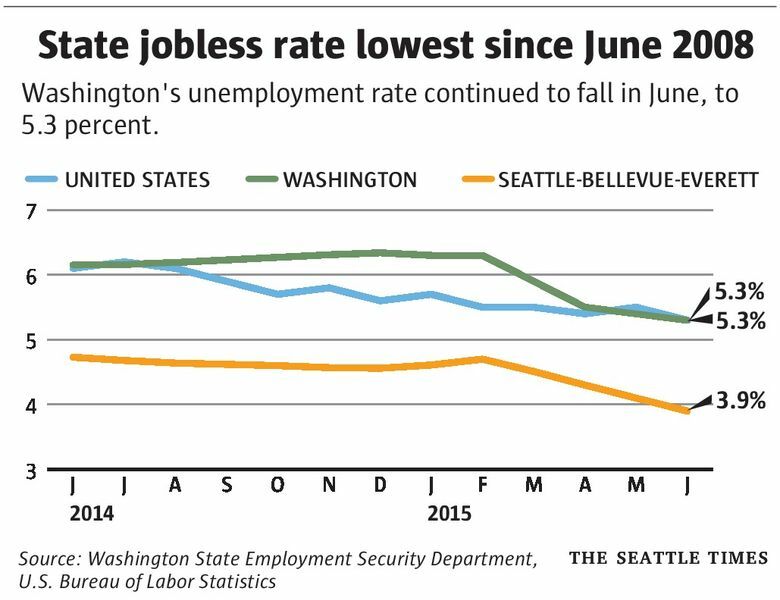 Unemployment in the Seattle/Bellevue/Everett area in June was 3.9 percent, down from 4.7 percent a year ago. In the past year, the state unemployment rate has gone down in inverse proportion to the number of construction cranes going up. Washington state nearly leads the nation in job growth over the past year, much of it driven by growth in the construction sector. These days, one of the biggest issues facing the construction industry locally is the lack of enough skilled workers to fill the jobs. June’s unemployment rate, statewide, reached a 7-year low of 5.3 percent, according to preliminary seasonally adjusted figures released Wednesday by the state Employment Security Department. That’s down from 5.4 percent in May and 6.1 percent in June 2014. The 5.3 percent figure is also the same as the national unemployment rate for last month, which was down from 5.5 percent in May and 6.1 percent a year ago. Unemployment in the Seattle/Bellevue/Everett area in June was 3.9 percent, down from 4.1 percent in May and 4.7 percent a year ago. The state gained 3,900 new jobs from May to June, and added an estimated 114,700 jobs year-over-year. Indeed, Washington was No. 2 in the nation, behind Utah, in the percentage growth — 3.6 percent — in numbers of jobs in the state from May 2014 to May 2015, according to the U.S. Bureau of Labor Statistics. The construction sector played a key role in that, adding 17,700 jobs statewide between June 2014 and June 2015, second only to the professional and business-services sector, which added 20,800. Still, the industry has not fully recovered to its pre-recession peak. “It’s going to take quite some time before we get back to the level of employment that was reached prior to the recession when it comes to construction,” said Paul Turek, state labor economist with the Employment Security Department. “Part of it was due to the fact that construction employment was considered to be abnormally high” during the housing-bubble period. And last month was weak for the sector, with the number of jobs in the industry declining by 1,300 on a seasonally adjusted basis. “It fell below expectations,” said Turek, who cautioned that one month does not amount to a trend. 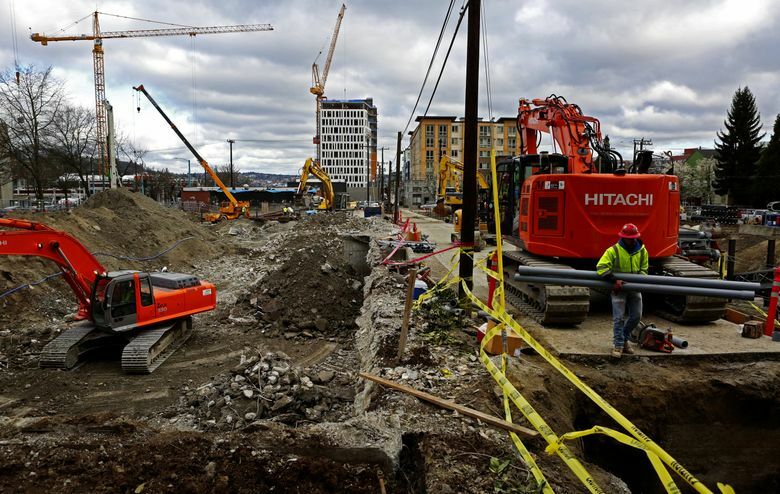 “There’s still some skepticism out there about whether (the construction growth) is long-term,” acknowledged Shannon Affholter, executive director of Master Builders Association of King and Snohomish Counties. Still, he said, indications favor continued growth for the industry, with overall permits for the Seattle market up 53 percent through April compared with the first four months of 2014. Permits for multifamily construction rose 104 percent, he said, with 6,700 units permitted compared with 3,313 permitted last year. The challenge now is finding skilled workers to fill jobs vacated by those who left the area or turned to other jobs. 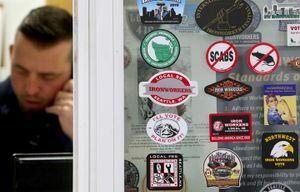 “Anecdotally, during the recession, it was not uncommon for our members to have laid off about 50 percent of their staff or more,” Affholter said. Union-apprenticeship programs are filling up the gap. “We have been actively looking for apprentices,” though now there’s a waitlist, said Jeff Glockner, business manager for Ironworkers Local 86. Local 86 currently has 400 apprentices, up more than 100 from the recession but still less than the 600 apprentices it had in 2007.